There are 5 flavours on offer – Lemon & Lime, Orange & Mango, White Peach, Grape & Berry and Strawberry. I’ve been nibbling at Lemon & Lime for a few days now. Will bring my thoughts in a few. 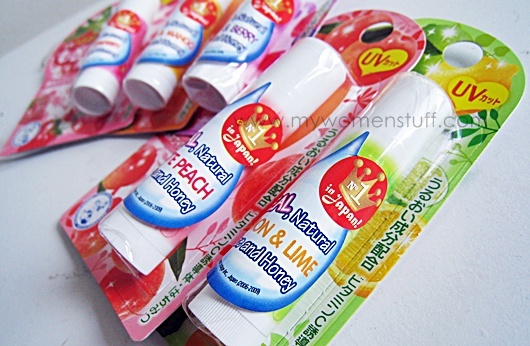 Mentholatum Mojitate Kajitsu Fresh Fruit lipbalms come in 5 flavours and retail at RM11.90 only at Watson’s Personal Care Stores. PREVIOUS POST: Strivectin Instant Moisture Repair Daily Hydrator: Did You Help My Dry Cheeks? Yup some lipbalms have that horrid oily feel. I rarely use lipbalms too. bee gave me the sitolobelli one. love the smell!!! Really! Found the 2 I’m using quite sweet so I can imagine the Strawberry one! Ooh, I’m a sucker for lipbalms! Shall have to check out next time I’m in a Watsons. All flavours sounds delicious! ooh so colorful! haven’t tried before. shall wait for your review. I’m not sure if I’ll pick this up – I’ll have to read the ingredients before I put my money down.